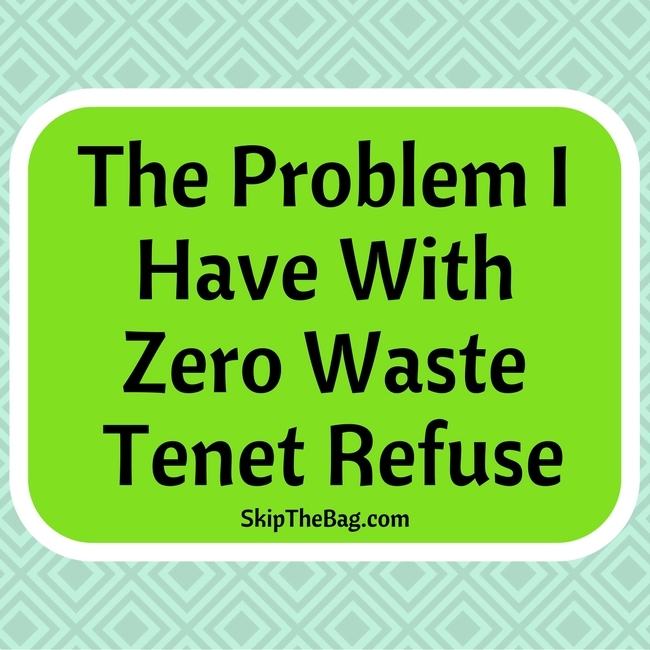 Earlier this week I posted on the Zero Waste Tenets, which are the major principles you see zero waste bloggers refer to. They are refuse, reduce, reuse, rehome, recycle, rot. I think they are very good and give you some ideas on what to do to help minimize your impact on the earth. Unfortunately I have a problem with the way some people follow the first tenet of refuse. Refuse alludes to avoiding any unnecessary items from entering your home. It sounds great in theory, but I feel like some people follow the letter of the law, but not the spirit of the law. They are gaming the system to make themselves look better, but not actually make any real change. Let me try to describe this using an example I saw recently. Someone had a sign on their front door, by their mail chute, telling the postman not to deliver junk mail to their home. a commission which is used to help fund the blog, but the price to you remains unchanged. The people were thinking it is a perfectly good way to help assist in their goal of refusing waste they do not need (I assume, otherwise why would they do it?). However, I feel that their action doesn't actually limit the amount of waste created, it just means someone else has to deal with it. Let's say there is a new mailman who doesn't know your desires. This scenario, by the way, is exactly why they were posting a picture of their sign. So this new mailman carries a piece of junk mail to your door and sees the sign. He wants to respect your decision so he doesn't deliver it, but now he has to carry the letter back to the mail truck. From there it's far less likely that the mail will get recycled versus thrown away. Those people were happy because they no longer had junk mail to deal with. However you created extra work for the mailman and likely meant that the letter ended up in the trash, the very thing you were trying to avoid. Now what would be a better alternative? 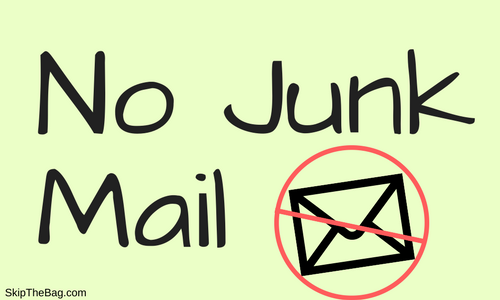 First you can opt-out of mailings and/or sign up for electronic communication wherever possible. This would prevent the junk mail from arriving in the first place. However if you get a stray piece of mail you could address it with the company directly and express your wishes to be removed from their list. Furthermore you could recycle or repurpose the letter. This ensures that it is being handled consistently with your goals. I see other examples of people refusing items such as selecting fruit that doesn't have a sticker, or worse yet, picking off the sticker to leave at the store. 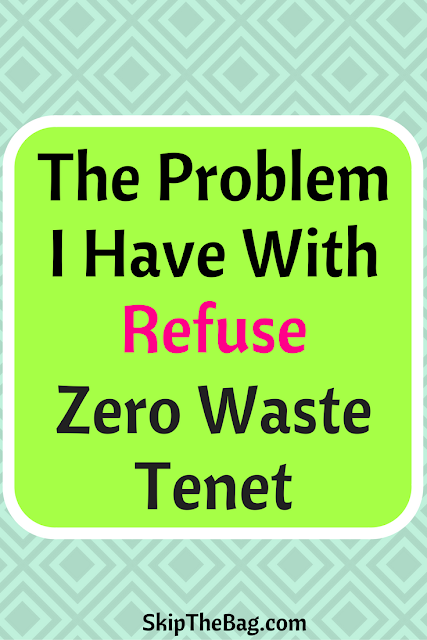 That refusal doesn't affect the amount of waste, it just means it's going in the store's trashcan rather than yours. However if you purchase items from a farmer's market where the farmer doesn't mark her produce it would be a net refusal. Even if the farmer did put stickers on their produce, you could ask them not to place them on some for you the following week. My primary issue with people and the tenet of refuse is that they only are looking at refusals of stuff to make their mason jar of trash look better and not thinking about net refusals on the environment as a whole. What are your thoughts? I love to hear from opposing viewpoints as well as those who see my point. 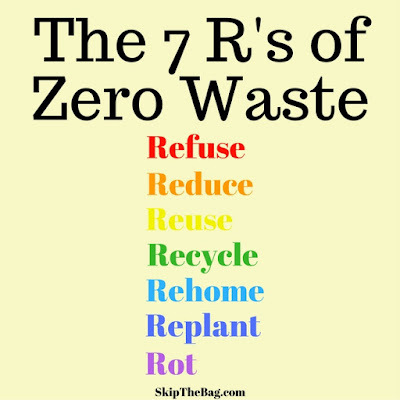 Don't forget to stop by and read more about the 7 Zero Waste Tenets! I have a similar problem with people who say to buy cuts of meat without any bones in them so you have no bones to deal with. It doesn't make the bones go away, they just end up in a different waste bin. I never thought about that! I tend to get boneless cause it's less of a hassle for me. Although if I got bones I could make stock, but I'd eventually have to trash it since we don't have commercial composting here. I wonder if butchers do something better with them. I understand your frustration with letter vs spirit of the law. I participate in Food Not Bombs, which rehomes food that the grocery stores would otherwise throw away. Much of the food is packaged, and at first I felt bad for how full my recycling and trash bins were. Then I realized that since I was preventing the food from joining the packaging in the trash. By properly sorting, I was overall improving the amount of waste sent to the landfill, at least recycling some of it, and feeding my family. The point of zero waste isn't to redirect trash from my can to yours, it's to work together to consume more responsibly. What a great organization. You are right it is still making a huge impact even if there is waste created. I love how you worded that "to work together to consume more responsibly." This is what i always used to think when i would hear others talking about not buying something because its bad for the environment. Literally, id say well, i mean the cow is already dead so why not just eat it? But i had never thought about the supply part where if its not being demanded then the supply goes down. Its basic economics, but just not something that anybody thinks about. What you are talking about in this post is so true! Avoiding trash in this way only makes somebody feel good, but isnt actually going to make a difference. The only way to make a difference is to reduce the actual demand of the product and not buy something if it has plastic. Unfortunately that is a lot easier said than done, though.